The ski-ing season's upon us, and chalet food makes me think of Tartiflette. Tartiflette's a French dish from the Savoie region, which originated in the Aravis valley, the home of Reblochon cheese. Curiously, it was invented as late as the 1980's in an attempt to boost sales, and then heavily promoted by the relevant trade unions to increase employment in the area. This is how you make it: First fry some chopped smoked bacon, and sliced onions for about five minutes in your favourite pan. If you've got some goose fat, use that. Next, slice up some waxy potatoes, and arrange them in a bottom of a dish, which you've previously greased with the goose fat. It might also be a good plan to rub half a garlic clove over the dish as well- this will give the Tartiflette a subtle garlicky flavour, without killing off all the other flavours in the dish. Season the potatoes with salt and pepper, and then cover them with the cooked bacon and onions. Add a layer of Reblochon cheese which you have cut into small cubes. It would be worth you while to track down some authentic Reblochon- as this gives the dish its authentic edge. Try you local deli, and see if they stock it. If they don't it's always worth making a fuss- in the nicest possible way of course, and they may be able to get some in for you. Finally, it's a simple matter of adding another layer of sliced potatoes, some more cheese, and finishing off the thing with a carton of double cream, unsalted butter and more salt and pepper. Bake in the oven for over an hour, until the cheesy cream topping goes brown and crusty. Back in the late 1960's, our Swiss au pair brought back a funky fondue set. I remember it well: a beaten copper affair, raised on a nifty wrought iron stand. 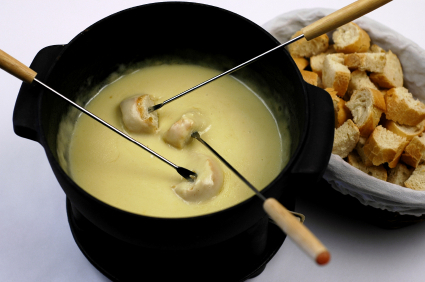 I happen to think that the best fondues use authentic cheese recipes. Recently, however, a bad, mad, and dangerous tendency has crept in for sickly, over rich chocolate fondues with cake, strawberries, sweeties, and the like. Please avoid them at all costs. Here's how to make a genuine Swiss cheese fondue: grate ½ llb of Swiss cheese (Emmenthaler is ideal), and ½ llb of Gruyère into a pan. Start melting the cheese on a medium heat. It's important not to boil the cheese, over-stir it, or let it get cold. All these things will encourage separation and stringing. Carefully stir in two tablespoons of flour or cornstarch. Again, the flour will help to prevent separation. Add a tablespoon of dry mustard. When the cheese, flour and mustard have melted down, add a cup of dry white wine, a generous dash of Kirsch, a squeeze of lemon juice, and some grated nutmeg. That's it. You then dip in hunks of fresh white bread into the cheese sauce. Traditionally, if you loose your bread in the cheese, you're supposed to pay a forfeit. Having seen The Stepford Wives, I can imagine the sort of saucy things our parents got up to forty years ago, though I stress that in our family, the forfeit was always a bottle of Kirsch. More Christmas food from The Greasy Spoon. 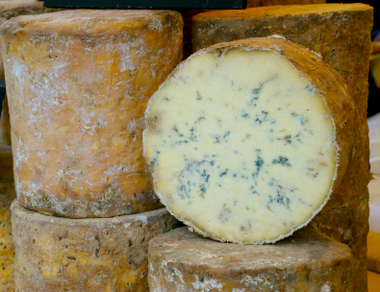 Stilton is a famous English blue cheese only made in the counties of Derbyshire, Leicestershire, and Nottinghamshire. It has a creamy, crumbly taste which improves with age. It's also quite similar to the Danish Blue. To make Potted Stilton, you need to mash some up with a third of its weight of unsalted butter. Next add a pinch of cayenne pepper, and a bit of nutmeg. Add some port, and carry on mashing. If it gets too runny, add a good hard cheese to thicken it up. Pack the cheese mixture into a ramekin dish, and bung it in the 'fridge. It will make an interesting alternative to the cheese course, and is highly, highly suitable for this time of year. Drink it with port- if you're extremely fortunate, something like a Fonseca '63. I'm lucky enough to have a few bottles of the stuff left, but recent tastings have been a bit disappointing. It was probably at its peak about five years ago, so need to drink it up fast. Life is so darn hard.